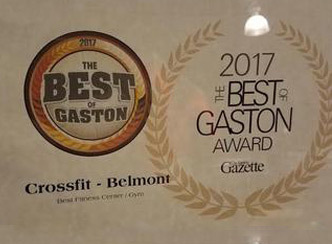 Welcome to CrossFit Belmont in Belmont N.C.! WE'RE GLAD YOU FOUND US, AND WE LOOK FORWARD TO MEETING YOU. FEEL FREE TO STOP IN, AND CHECK US OUT. WE'D LOVE TO SHOW YOU AROUND CROSSFIT BELMONT! We are a strength biased, functional fitness facility. Our athletes (that's how we refer to our clients) see results that are a direct reflection of the work they put in. They get stronger through weightlifting, faster through sprints, more mobile through gymnastics, and healthier by adjusting their diets to maximize performance. Come by and see what the fuss is about! We require all new athletes to attend our complimentary Foundation Series. The series is made up of 4 classes spread over 2 weeks. We offer morning and evening classes. You can mix morning and evening classes, as long as you attend all 4 classes. Check out the Foundations page for dates and times! Thank you Mark and Lisa!!! We dropped in at Crossfit Belmont while visiting family. Everyone is so welcoming! The facility has everything you would need and very knowledgeable coaches. Lisa interrupted her own workout to help my brother and I with hand stand push-ups! She also gave us some great tips for strict pull-ups and push-ups. All of this just by dropping in. I can only imagine what the classes are like! Thank you again, we will definitely be back when we're in town again! Dropped in from Oregon, this is an awesome space, good coaches, good people. I've been to a lot of boxes and have seen the good the bad and the ugly and can say with confidence this is a great box. If you have a chance to visit or join, this is the box you want. I was in town to visit family and wanted to get a decent workout in. I got way more than I bargained for. Everyone I met was extremely welcoming and helpful. The coaches were very encouraging and, more importantly, knowledgeable. One even interrupted their own workout to give assistance. I might visit Belmont more often just to workout, AMAZING! This box is an amazing place to visit! It's super clean and has a great atmosphere! The people are very friendly and helpful! Marc runs a great box! Top notch CrossFit box! Lead coach/owner, Marc is very knowledgeable & runs a very clean, organized box. The members & other staff members are friendly, helpful & welcoming. You can't go wrong giving CrossFit Belmont a try if you are in their area.